Are Liverpool fans really the worst in Europe? Liverpool fans have been labelled the worst in Europe. A Uefa report says Reds fans have been involved in more incidents in Europe â€“ 25, to be precise â€“ during the past four years than any other club. The damning report on the club’s fans will be handed to sports minister Richard Caborn tomorrow. At the Champions League final in Athens thousands of Liverpool fans reportedly turned up without tickets or with known forgeries, charged the barriers, stole tickets out of the hands of children and caused general havoc but Uefa, an organisation which seems to have something against English football in general, must take some of the blame for shoddy organisation – the 2005 Champions League final in Istanbul passed without major incident, as I recall, and that also involved Liverpool. That said, I think Liverpool fans are generally among the worst when it comes to accepting criticism – nothing is ever their fault. Like most clubs, they do have a section of nasty ‘fans’ who travel abroad under their colours. Neither should we forget that it was the actions of Liverpool fans that led to English clubs being banned from Europe in the Eighties. But in answer to the question posed in the headline of this post, no I don’t believe Liverpool fans are the worst in Europe, not by a long way. 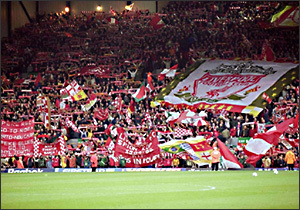 Quite the opposite – Liverpool fans generally are among the best in Europe and support their team with a level of passion that shames most other club’s supporters. Who are the worst fans you have encountered? They’re pretty bad as a whole. How can 20,000 morons go to a ground without a ticket and all expect to get in ? I think there were a lot of season-ticket holders and genuine fans who felt they deserved to be there on merit. Not a very rational decision, but then being a football fan is very irrational. Whilst it was their actions that did it, that was down to the group more than the fans I think. Roma fans have been worse in the last two seasons I think. Its called passion. They wanted o see the game so much that their judgement was clouded. Im an Arsenal fan but i can see why they wanted to get in. Could the 25 incidents be due to the fact that they have been so successful in the last for years?? i doubt there is many teams who have played many more games in that period. Ain’t that the truth. The club too. The club refuses to even acknowledge that Liverpool fans acted improperly at Athens and instead want to place all the blame with organization and security. Well better security would not be needed if everyone behaved themselves a bit better. BTW Collie, Milan have been just as successful as Liverpool in Europe over this stretech and there has been narry a problem with their fans.